Featured resource: "The Promise of Dental Screening Laws to Improve Children's Oral Health"
CDHP held a webinar in February 2019 addressing the potential of state Dental Screening Laws to support children's oral health needs and access to care. For background, see CDHP's report, State Dental Screening Laws for Children: Examining the Trend and Impact. Find the recording, slides, and related resources under the WEBINAR section below. More than 45 million children count on Medicaid or the Children's Health Insurance Program (CHIP) for their medical and dental coverage. 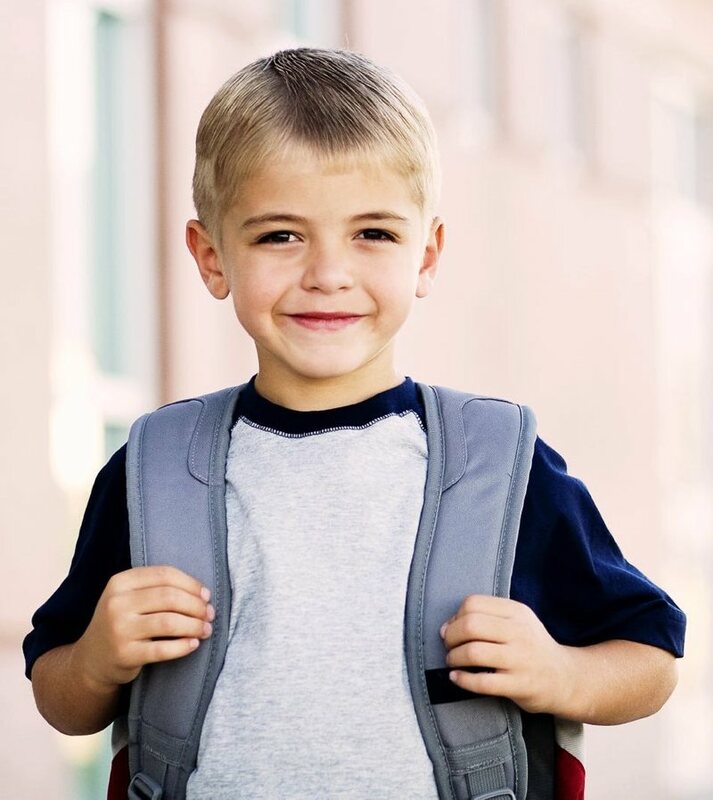 Medicaid provides children with a unique set of EPSDT (Early and Periodic Screening, Diagnostic, and Treatment) benefits. This establishes a solid benchmark of care for kids. At the same time, Medicaid allows states the flexibility to develop innovations that are likely to increase the number of children who receive dental services or to deliver services in a more cost-effective manner. Federal lawmakers renewed CHIP for a full 10 years on February 9, 2018. This historic move came after Congress extended CHIP for 6 years in January, and after letting its federal funding expire on September 30, 2017. Nine million children and more than 300,000 pregnant women count on CHIP every day. The Affordable Care Act, sometimes called Obamacare, has enabled many families with incomes too high for Medicaid/CHIP eligibility to secure dental coverage for their kids. It also increased the number of adults with dental coverage. The ACA filled a significant gap that used to exist because many working parents had employers who did not offer dental coverage at all or did not make it available to their employees' children. As more and more children have gained dental coverage in recent decades, the rate of untreated tooth decay has fallen among children — even among low-income kids. 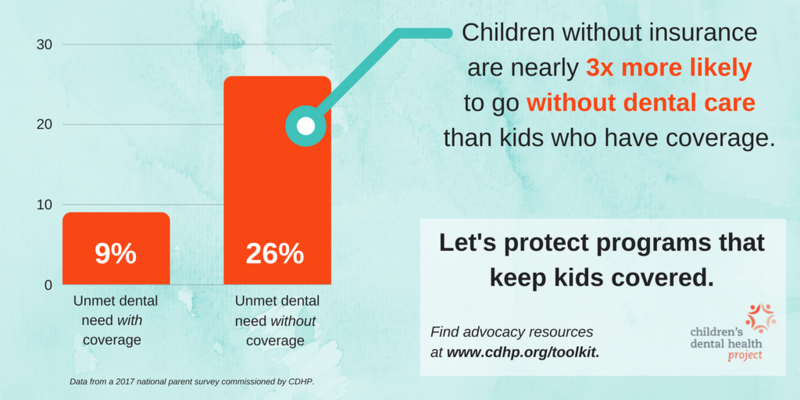 Recent research adds to the evidence showing how crucial dental coverage is for a child's health. A recently published study showed that children with public or private dental insurance had more dental appointments and fewer unmet dental needs. Uninsured kids had the fewest dental appointments, and their parents were most likely to report unmet dental health needs due to cost. In other words, coverage opens the door to children receiving the care they need to stay healthy. Because nearly 4 in 10 children are insured dentally through Medicaid or CHIP, any changes to these programs could have a major impact on kids' oral health. 1. Fast Facts about Oral Health & Dental Coverage: This two-page document shows why oral health is so important, shares the serious consequences of poor oral health and explores the critical need for affordable coverage. Consider sharing this with your members of Congress (House and Senate) and your state legislators. 2. Key Messages about Dental Coverage: This one-pager provides several talking points about why the plan created by the House Republican leadership would be a big step backward for children's oral health, particularly the most disadvantaged kids. These messages will be periodically updated to reflect new information and analyses. 3. Oral Health for Children in Health Reform Discussions: These PowerPoint slides were created by CDHP for a Congressional briefing. Feel free to share these slides with other stakeholder groups in your state or consider incorporating some of these slides' content into your presentations or remarks to policymakers. Slides 6-10 focus on how Medicaid and CHIP coverage reduce kids' unmet dental needs, while giving states sufficient flexibility in shaping their programs. See chart at bottom of page for archived Medicaid resources. Oral health implications of waiver trends: This blog, authored by policy experts at CDHP and FamiliesUSA, explains how oral health coverage and care could be impacted by the range of Section 1115 Medicaid waivers that states have proposed and/or are implementing. -- ​FamiliesUSA: Waiver Strategy Center and description of Medicaid waiver elements, including provisions impacting oral health. -- Kaiser Family Foundation: Issue brief that includes an interactive map. Letter to CMS (June 26, 2018) urging the agency to reject 1115 Medicaid waiver proposals that would establish harmful obstacles to dental and medical coverage and care for low-wage families, by CDHP and more than 30 oral health partners. Comments on Kentucky and Mississippi Medicaid waivers (August 17, 2018). Submitted to the U.S. Department of Health and Human Services, these CDHP comments focus on threats to oral health in each proposal. We appreciate guidance proovided by the Kentucky Oral Health Coalition on that state's proposal. CDHP's Quick Guide to the CMS Pediatric Dental Bulletin, reviewing how advocates can work with different oral health stakeholders, such as health officials, insurers, and families, to ensure Medicaid and CHIP meet every child's needs. In the "webinar" section below, download the slides & recording from a presentation on the bulletin's background and strategies to advance change. 3. Medicaid Caps Would Harm Children and Pregnant Women: This one-page public statement was issued by CDHP, the American Academy of Pediatrics, March of Dimes and five other organizations that advocate for children's health. As the statement warns, "Over time, capping Medicaid would likely force states to ration care, reduce eligibility levels, reduce benefits for children, or reduce provider reimbursement rates even further — all of which will result in diminished access to care for children and pregnant women." 4. News Release for "Keep Medicaid Strong for Kids": This March 22, 2017 news release, issued by CDHP and six other medical/children's advocacy organizations, urged Congress to keep Medicaid strong for children by voting "no" on the proposed American Health Care Act (AHCA). As the release explained, AHCA "would allow states to choose a block grant model, which would eviscerate existing protections afforded to children and pregnant women in the Medicaid program." CHIP is thankfully secured through 2028. However, it is critical to continue sharing with lawmakers the importance of the program. The below resources can help you speak with decision makers about the value of maintaining and strengthening CHIP. Visit Teeth Matter, CDHP's blog, for further updates. See chart at bottom of page for archived CHIP resources. 1. Blog, CHIP renewed for a decade! After letting federal funds expire on September 30, 2017, federal lawmakers ultimately extended the program for ten years on February 9, 2018. 2. Fact Sheet: The Children's Health Insurance Program (CHIP): This three-page document summarizes why CHIP fills what would otherwise be a critical gap in coverage for children. 3. Video: Pediatric Dentist Talks about CHIP's Importance: In this 28-second video, Dr. Jonelle Anamelechi briefly explains why the CHIP program plays a crucial role in helping children maintain good oral health. Dr. Anamelechi is a dentist in New Carrollton, Maryland. 4. Social media engagement: For continued updates and content you can easily share to boost support for CHIP, be sure to follow @Teeth_Matter on Twitter and like @childrensdentalhealth on Facebook. 1. How the Affordable Care Act moved oral health forward, a blog highlighting progress the law has made on children's and families' oral health. 2. Analysis of federal efforts to erode benefit guarantees - such as children's dental coverage - and consumer safeguards established by the Affordable Care Act, including deep cuts in navigator funding and rolling back regulations on short-term health plans and Association Health Plans. 3. Guide: Buying children's dental coverage through the marketplace. Updated for 2018, CDHP and Families USA created this guide to help families find the pediatric oral health plan in the state marketplace that works best for them. Open enrollment for 2018-19 runs from Nov. 1 - Dec. 15 in most states. 1. Banners for Social Media & Websites: Two different banners have been created to raise awareness of what's at stake for dental coverage. These shareable images can be attached to messages posted on Facebook or Twitter. Banner 1 points out why coverage is so crucial, sharing survey data showing that dentally uninsured children are nearly 3 times more likely to go without dental care than kids who are insured. 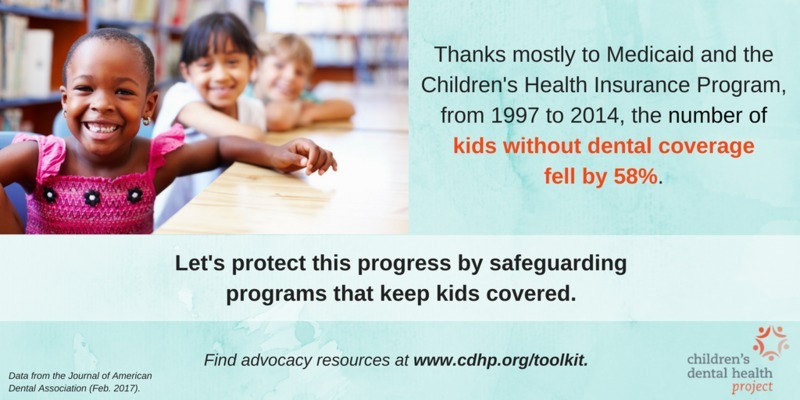 Banner 2 urges lawmakers to safeguard the historic progress our nation has made in raising the percentage of children who have dental coverage. 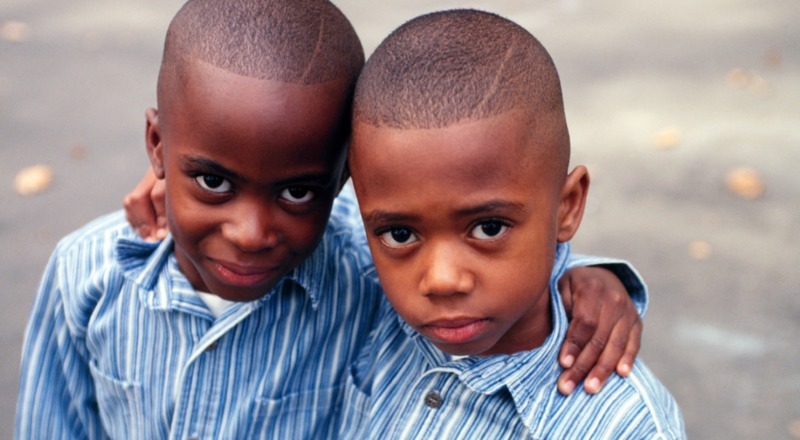 Over a 14-year period, the portion of kids lacking dental insurance plunged by 58%. 2. Children Enrolled in Medicaid - Interactive Maps: These interactive maps allow people to learn the percentage of Medicaid-enrolled children by county or Congressional District. These excellent maps were created by Georgetown University's Center for Children and Families, an organization with which CDHP is proud to partner. See chart at bottom of page for additional, archived webinars. 1. Webinar - The Promise of Dental Screening Laws to Improve Children's Oral Health. CDHP released a review of state laws that encourage dental screening for school-age children, State Dental Screening Laws: Examining their Trend and Impact. CDHP's Director of Policy Colin Reusch facilitated a conversation with experts to dig into its findings and share strategies to improve such laws. Panelists included Dr. Eleanor Fleming, report author and Boston University dental public health resident; Sara Schlievert, BS, CPH, RDH, Bureau of Oral and Health Delivery Systems at the Iowa Department of Public Health; and Karlene Ketola, MSA, CAE, Executive Director at the Mighigan Oral Health Coalition. Download the webinar recording or a PDF of the slides. Additional material: West Virginia's School Dental Exam Requirement Toolkit; Iowa Department of Public Health School Dental Screening page and i-Smile program site. 2. Webinar -- Prioritizing oral health during pregnancy. CDHP hosted a converstation in November 2018 on strategies to end barriers pregnant women face when seeking dental care in Medicaid, hurdles highlighted in CDHP's brief, Oral Health during Pregnancy. Moderated by Colin Reusch, CDHP Director of Policy, panelists included Dr. Rocio Quinonez, University of North Carolina (UNC)-Chapel Hill, and Lindsay Sailor, Michigan Primary Care Association (MPCA). Listen to the webinar recording and download slides. 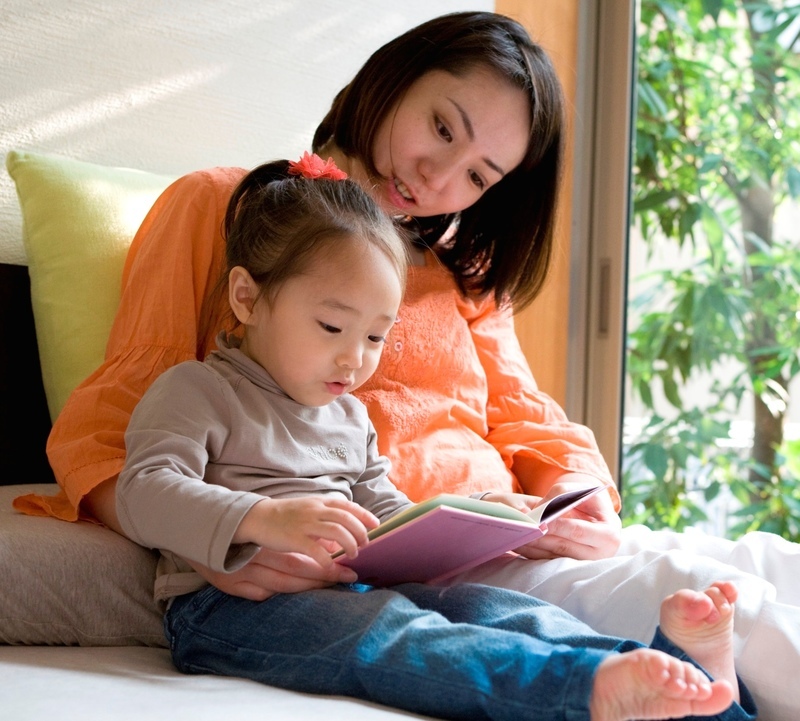 Additional resources: UNC-Chapel Hill's Prenatal Oral Health Program; MPCA's video on the MI Maternal Infant Oral Health Program; and a CDHP blog about the MI program. 3. Webinar -- Removing obstacles from children's dental care in Medicaid: A renewed push for change. Hosted by CDHP, recorded August 29, 2018, with speakers from CDHP, Georgetown Center for Children and Families, American Academy of Pediatrics, and past CMS officials. A 2016 report found that some state Medicaid and CHIP policies keep kids from getting the full range of dental care they need. This webinar reviewed strategies for progress in light of a federal bulletin released in May 2018. Download the recording, the slide deck, CDHP's Quick Guide to the Pediatric Dental Bulletin, and this Q&A that responds to questions raised during the webinar. Additional resources: Georgetown University Center for Children and Families' webinar, EPSDT Education for Providers and Advocates; American Academy of Pediatrics' Children's Health Coverage state fact sheets; and 2016 Child Core Set Dental Measures (also available at this Medicaid.gov webpage). 4. Webinar — Safeguarding Oral Health Coverage in the Marketplace in response to New Federal Rules. Recorded May 30, 2018. Hosted by CDHP and Community Catalyst (CC), this webinar reviewed how advocates can support children's oral health benefits and protections for families in light of threats posed by a new federal regulation, the Notice of Benefit and Payment Parameters of 2019 (payment notice). Download the recording, the slide deck, and CDHP's payment notice fact sheet. Additional resources: CC's grassroots organizing toolkit and storybanking toolkit; and Centers for Medicare and Medicaid Services page to review current Essential Health Benefits Benchmark Plans in each state. "Revisiting oral health advocacy: What have we done, what have we learned, and where are we going?" Reviewing key issues from 2017 and identifying those for 2018. CHIP 01/01/2018 Social Media Guide U.S. House and Senate By CDHP. Sample social media messages to support CHIP. Adaptable for Twitter, Facebook and other channels. CHIP 11/01/2017 Calling Your Members of Congress U.S. House and Senate By CDHP. Sample script to extend CHIP and links to Congress' contact details. CHIP 11/01/2017 Writing Emails & Letters to Members of Congress U.S. House and Senate By CDHP. Sample letter to extend CHIP and links to Congress' contact details. CHIP 11/01/2017 Writing Emails or Letters to Your Governor State governors By CDHP. Sample letter about extending CHIP, with links to find each states' governor's contact information. CHIP 11/01/2017 Calling Your Governor's Office State governors By CDHP. Sample script about extending CHIP with links to find each states' governor's contact information. CHIP 10/01/2017 Twitter or Facebook Graphic U.S. House and Senate Sharable social media image about the urgent need to extend CHIP. 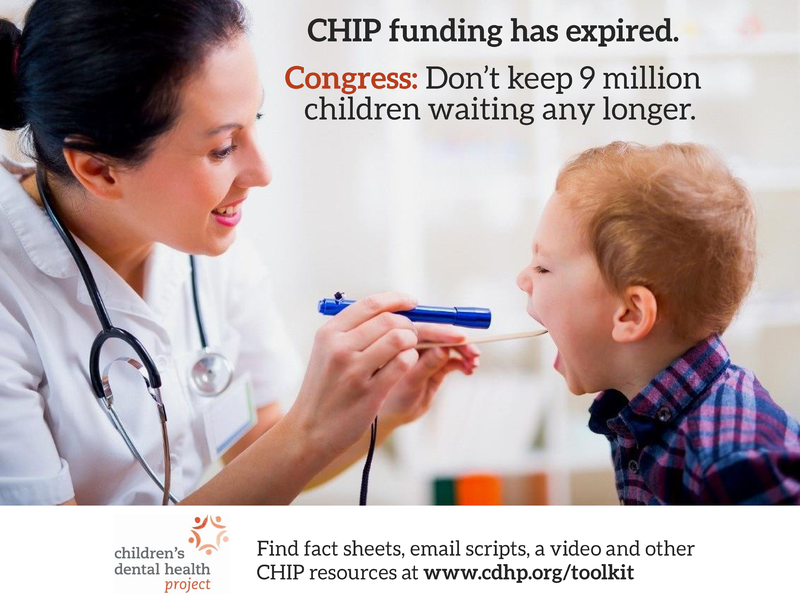 CHIP 10/03/2017 Oral Health Community Statement on CHIP CDHP and 100+ organizations Urging Congress to immediately extend CHIP. CHIP 10/02/2017 Statement Endorsing the KIDS Act CDHP Support for the KIDS Act to extend federal CHIP funding for 5 years. CHIP 09/29/2017 Joint Statement about Congress' Failure to Extend CHIP Funding CDHP and 7 children's health and medical organizations Urging Congress immediately pass the KIDS Act to extend CHIP. CDHP and other children's and family health organizations Urging Congress to reject an ACA repeal proposal. ACA 07/21/2017 Issue brief about the BCRA amendment offered by Senator Ted Cruz (TX) Kaiser Family Foundation Impact of the Cruz amendment on health coverage and affordability. ACA, Medicaid 07/05/2017 Fact Sheet about the Better Care Reconciliation Act (BCRA) CDHP Impact of BCRA on dental coverage and access. ACA 06/22/2017 Fact sheet about the American Health Care Act (AHCA) CDHP Impact of AHCA on dental coverage and access. CHIP 06/14/2017 Public Statement on CHIP by the Children's Community CDHP and other children's and family health organizations Urging Congress to stabilize and renew CHIP. ACA 06/12/2017 Children's Advocates Letter to U.S. Senator Bill Cassidy CDHP and other children's and family health organizations Addressing the AHCA proposal to repeal the health reform law. Medicaid, ACA 06/09/2017 Dental Community Letter to Committee Chairs CDHP, the American Dental Association, and 40+ partners that care about oral health Urging Congress to protect oral health coverage, and specifically safeguard Medicaid, amid health reform repeal debate. CHIP 05/11/2017 NGA Supports Continued Federal Funding for CHIP National Governors Association Urging Congress to extend CHIP for 5 years. ACA, Medicaid 03/22/2017 Children's & Family Advocates' Letter to Senate and House Leaders CDHP and more than 100 national and local organizations Urging Congress to "do no harm" to children as they consider the AHCA and other proposals to repeal the health care law; specifically asking lawmakers to safeguard key programs like Medicaid. ACA 02/27/2017 Dental Community Letter to U.S. Senate Committee CDHP and 17 other oral health organizations Urging Congress to safeguard oral health in any proposal to repeal the health care law.